John Newland is your guide into the unknown in four lost shows from the classic paranormal anthology, including 'The Sacred Mushroom', the rarest episode of the series! NIGHT OF THE KILL: A small boy returns home after being missing for three days, telling his parents that he was kidnapped by Bigfoot. Despite the child's insistence that it means no harm, a lynch mob wants to kill the creature. This unique episode, one of the first television depictions of the Bigfoot phenomenon, stars John Marley, best known for John Cassavetes' masterpiece Faces (1968) and his unforgettable part in The Godfather (1972). THE DEATH WALTZ: A two-timing Southern belle is haunted by the ghost of a former lover. "The Death Waltz" stars Elizabeth Montgomery, years before she became a household name for Bewitched (1964-1972). IF YOU SEE SALLY: A ghostly female hitchhiker haunts the highways, and vanishes before the drivers who pick her up can reach their destination. According to Gary Gerani's 1977 book Fantastic Television, ABC was inundated with letters from viewers reporting similar experiences after "If You See Sally" was broadcast. THE SACRED MUSHROOM: One Step Beyond breaks format to present this documentary-style episode, in which series host John Newland journeys to Mexico to investigate reports of hallucinogenic mushrooms endowing the locals with telepathic powers. By show's end, Newland has ingested the mushrooms himself, and had a life-changing experience. "I think I understand...why for so many centuries they called this mushroom...sacred." According to Newland, series sponsor Alcoa would only air the program if he allowed his reactions to the mushroom to be filmed, putting his stamp of approval on the testimony of the other interviewees. 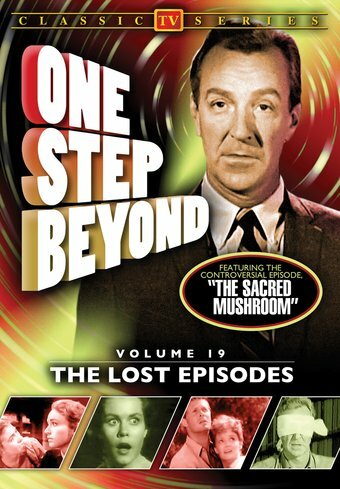 However, due to growing concerns about drug abuse, "The Sacred Mushroom" was rarely rerun after its initial broadcast, making it the rarest episode of One Step Beyond. Note: Due to the age and rarity of these episodes, some audio and video anomalies do exist.